With all the hubbub of reviews and podcasts — not to mention the hours I’m putting in on the film — I nearly forgot to post chapter one of Fat Head Kids. I’m addressing that oversight now. Again, I can’t recreate Chareva’s two-page layouts in a blog format, but all the text and most of the graphics are included. It’s no fun being a fat kid, period. If you’ve been getting fat, I know you want to change that. And I’ll bet at least a few people have already told you why you’re fat and what to do about it — like the classmates who explained it to me. What these helpful young men were telling me is that people get fat because of a flaw in their character: They like to eat, so they eat too much, and then they get fat. So to lose weight, they just need to apply some willpower. Eat a little less, exercise a little more, or both. It’s kind of strange if you think about it. Fifty years ago, very few Americans were overweight, but almost nobody counted calories. In fact, the calorie labels you see on food now didn’t even exist until the 1990s. Nowadays we have lots of fat people, and everyone seems to be talking about calories. Cut the calories, cut the calories, cut the calories! So what’s a calorie? To understand calories, let’s forget about food for a minute and talk about something you wouldn’t eat unless you’re a termite: wood. If you had a nice piece of wood, you could chop it into pieces and build something useful, like a chair. Or you could store the wood for later. Or you could toss it in a fireplace and burn it to produce heat. How much heat? Well, there are different units for measuring heat, but the common ones are BTUs (British Thermal Units), joules, and … calories. So technically, a calorie is a unit of heat. But heat is also a form of energy, and in our world, energy makes things happen. Back in the Old West, people burned wood to boil water to make steam. The steam could turn an engine big enough to move an entire train. So we could say the energy to move a train came from the calories in wood. It’s the same with food. To determine the calories in food, scientists burn it in something called a calorimeter and measure the heat. 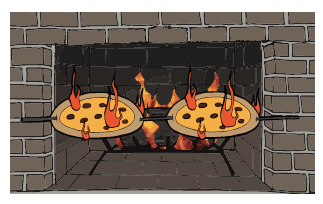 No, they’re not trying to figure out how many pizzas you should burn to keep your house warm. They’re measuring how much energy the food would produce if you burned it all for fuel. But you don’t burn all your food for fuel. Some of what you eat is broken down into building materials for the rest of your body. Some of it is converted to fat and stored in your fat cells. That way your body can burn fat for fuel between meals. If you couldn’t store calories in your fat cells, you’d have to spend most of your life eating. Every time you eat, you deposit calories in your body. Some of the food goes into your body’s Building & Repair Fund, and some goes to pay your daily energy bill — the energy your body burns just to stay alive. But if there’s any extra food left over, those calories are automatically converted to fat and stored in your fat cells — like saving money in the Piggy Bank. With a real piggy bank, it’s easy to control how much you save. If you deposit $50 every week and withdraw $40, your piggy bank will grow by exactly $10 each week. If you deposit $50 every week and withdraw $60, your piggy bank will shrink by exactly $10 each week. It’s a simple matter of calculating dollars in vs. dollars out. According to The Piggy Bank Theory, losing weight works by the same simple math. To shrink your fat cells, you just deposit fewer calories by eating less. Or you spend more on the energy bill by exercising. If you do either one, your body has to withdraw calories from the piggy bank, so you lose weight. 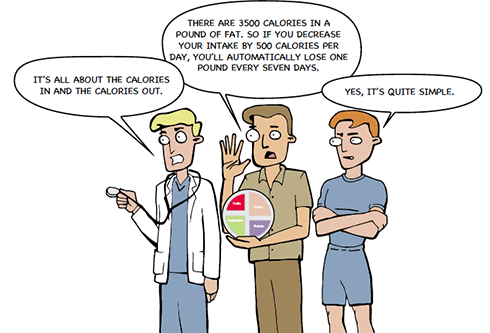 It’s a simple matter of calculating calories in vs. calories out. If you cut just one pat of butter from your daily diet and walk for just 20 minutes every day, you’ll lose 20 pounds of fat in a year! Well, that sounds easy, doesn’t it? So according to these people, if you’re fat, it’s because you’re not willing to eat just a little less — which means you’re a pig. Or you’re not willing to exercise just a little more — which means you’re a lazy pig. But does that really make sense? 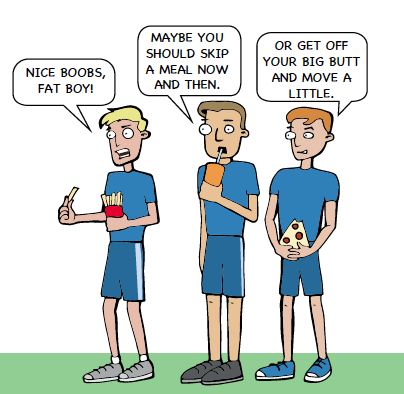 Most fat people hate being fat. They spend billions of dollars on gym memberships, weight-loss clubs and weight-loss drugs. 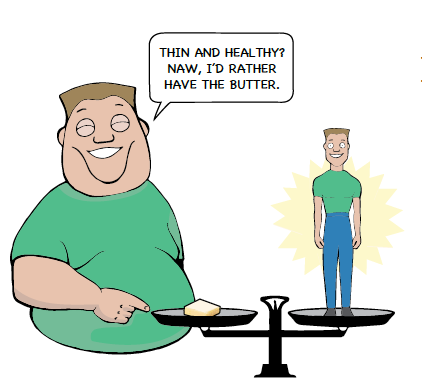 Are we supposed to believe they’d rather be fat than give up one pat of butter per day? If people get fat because of their character, why are there more overweight babies now than 30 years ago? Did babies in previous generations drink less mother’s milk so they wouldn’t get fat? Did they go to baby-aerobics classes? If your body works like a bank account, how do we explain naturally thin people, like my wife? They have no idea how many calories they consume and eat whatever they like, but never gain weight. That’s like making lots of deposits and withdrawals at your bank, without ever bothering to add them up … and yet every time you check your balance, it’s exactly 2,000 dollars. Here’s something else The Piggy Bank Theory can’t explain: We have two big dogs named Misha and Coco. They’re sisters, and we feed them exactly the same meals. Coco is bouncier and more active than Misha, so she ought to burn more calories, right? But Coco is 18 pounds heavier. In human terms, if Misha weighed 180 pounds, Coco would weigh 212 pounds. When we bought them as puppies, the breeder told us Coco would be bigger. She never mentioned calories. Obviously, there’s something wrong with The Piggy Bank Theory. Plenty of doctors and researchers have known that for years. In a study from the 1960s, researchers wrote about obese patients who were locked in a hospital and fed just 600 calories each day. That’s about one-fourth as much as most adults eat. And yet the obese patients didn’t lose weight. Is that because of a flaw in their character? Should they only eat 300 calories per day? Or 200? In an experiment at the Mayo Clinic, researchers had a group of volunteers eat an extra 1,000 calories every day for 56 days. According to The Piggy Bank Theory, those 56,000 extra calories should have made everyone 16 pounds fatter. But some people gained 10 times more body fat than others. The naturally-thin people barely gained any weight at all. In another experiment, researchers took a group of mice and reduced their daily calories by five percent. That’s the mouse version of cut just one pat of butter per day from your diet. They also used special lab equipment to make sure the mice were just as active as before. They were eating less, so they made smaller deposits. They were just as active, so their daily energy bill should have stayed the same. 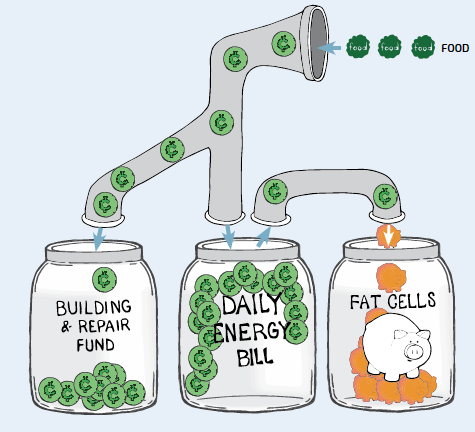 Therefore, according to The Piggy Bank Theory, the mice had to withdraw calories from their fat cells to pay part of the energy bill. So their fat cells had to shrink. But that’s not what happened. When the mice were given less food, their fat cells got bigger, not smaller. The commonly held belief that obese individuals can ameliorate [improve] their condition by simply deciding to eat less and exercise more is at odds with compelling scientific evidence. If your goal is to lose weight, let me ask you a question: Would your school hire a football coach who lost 97 percent of his games? Would your parents hire a piano teacher if 97 percent of her students never played any better … and some ended up playing worse? Of course not. 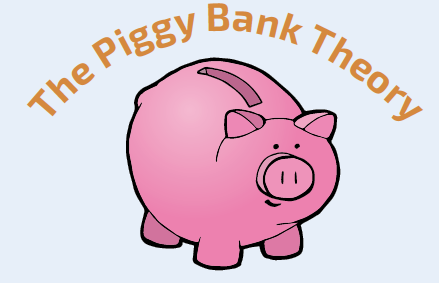 But year after year, millions of people try to lose weight by following The Piggy Bank Theory. And year after year, 97 percent of them fail. In fact, many end up fatter than before. People who believe in The Piggy Bank Theory argue that it’s based on the Laws of Physics. Matter and energy can’t just disappear or be created out of nothing. So to get bigger, you have to consume more calories than you burn. That statement is true. But for explaining why people get fat, it’s also meaningless. It’s like saying Donald Trump is rich because he deposited more dollars in the bank than he spent. It’s like saying if your toilet overflows, it’s because more water went into the bowl than went out. Yes, of course more water went into the bowl than went out. But that only explains HOW the toilet overflowed. 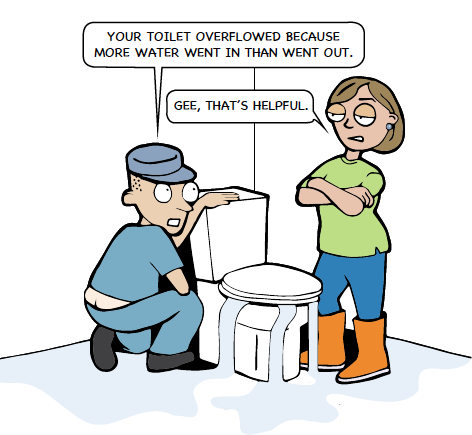 It doesn’t tell us WHY the toilet overflowed. The WHY in this case would be a clog in the drain pipe. To fix a problem, you can’t just describe HOW it happens. You also have to understand WHY it happens. We’ll begin looking at WHY we get fat in the next chapter. Great first chapter! Clear and easy to follow. Thumbs up. Wonderfully explained. Think I’ll send it to my 30 yo son, who just signed up for Nutrisystem. Perhaps you’ll save him some $$ wasted on packaged foods. Great first chapter! I’ve had my book for a week, but because of family illness, haven’t gotten to read it. Now I can. As it happens a friend ACTUALLY came and talked to me yesterday, because she has steadily gained weight- now at 5′ 1″ tall, she has ballooned to 175 pounds, which looks like a lot more on her tiny frame. Her doctor had scolded her, sent her to a dietician who recommended SAD- heart healthy whole grains, plenty of fruit, etc., doncha know! Well, she was in tears and said she got fat on that and her doctor practically called her a liar! She wanted to know what I did to lose weight. So, we talked a bit, but then I parted with my Fat Head Kids. Well, it helped your sales a wee bit. I never loan a book with the expectation that I’ll get it back, so I went and ordered another copy. This time, I’ll make sure I read it before I give a copy away. LOL! Thanks for all you do! Now I can’t wait to get my second copy and read past Chapter One!! You’re a good friend to give away the book to someone who might benefit from it. And of course, we’ll happily take the extra sale. I will order it and read it myself and then try to see if Swedish children want to read and understand. I work in a school (the pupils are 6-16 years old) and they learn english so easily with internet (games, youtube and movies). The Swedes I’ve met all speak English perfectly, so I’m guessing Swedish children learn it at an early age. Matter of necessity. The countries are the size of our states. Yep and their proximity to each other factors in. I also think it is a nice skill to have, especially if you watch a lot of foreign TV and film like I do. Subtitles can be rough at times. My wife’s sister married a man from Sweden and now lives there with her kids. Sweden has an excellent school system, and they learn English from an early age. Meanwhile, both my kids are taking foreign languages (French and Spanish, the latter being immersion — the teacher speaks no English in class), but I have zero hope they’ll ever be fluent. There’s no one we know who actually speaks these languages. As for the book, I’m almost to chapter 4, and I like it so far. The problem: I’ve read maybe 30+ books on this topic. I know too much. I’ll reserve final judgement until my 9 year old reads it. She is already being/has been inculcated with the low fat, high fiber, etc., doctrine. That’s the problem with learning a foreign language in a region where nobody speaks it: use or lose it, and we tend to lose it. Hello Margarete. It’s good to see you again! Ordered book from Indigo/Chapters in Canada& received it today. Thankyou so much for all your work! I will be sharing this with my 10 grandchildren. I think they will be much more receptive than the older generation has been! Sometimes I feel like I am hitting my head against a low fat, whole grain brick wall when I try to explain this to my husband & adult children. ? Maybe the cartoons will help. With the husband, I mean. 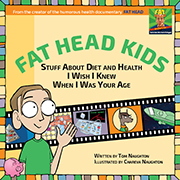 I just today received my copy of Fat Head Kids. I am not a kid at 60 but I am loving it! It makes everything so easy to understand. I have read a lot of wonderful LCHF books but this is wonderful AND FUN! I love the illustrations too! Thank you, Susan. We of course hoped adults would enjoy it too. Come to think of it, some people do spend most of the day eating. _The Vegetarian Myth: Food, Justice, and Sustainability_ by Lierre Keith has a lot of discussion of this phenomena in her life and those of her (at the time) fellow vegans. And there are those who have to get up at night and eat. Wow I comes up with the same toillet exemple. Great mind think alike ! I may have first heard that one from Gary Taubes. It was from Dave over at the Spark of Reason. I miss that blog. I’d bet you most of them have no idea what it is to be fat, to struggle constantly with weight, to be attacked as lazy and uncaring by everyone from neighbors to doctors. At least to me, a large part of the motivation isn’t health; being overweight is also considered a moral failing as well. I started working on my weight about two months ago and I started eating more meat about three weeks ago. First thing I noticed is that even if I’m still fat, I feel better physically and I have more energy during the day, even with the current heat zapping it. I’m slimmer and I’m working my way up to getting more exercise with about half my diet being meat. 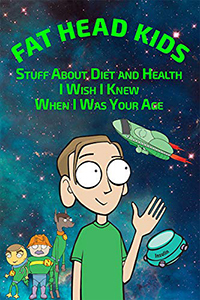 I’m seriously considering getting that book, despite the fact that at 27, I’m far from being a kid. Adults seem to be enjoying it as much as kids, which is what we hoped would happen. why is jimmy moore morbidly obese if calories don’t matter? So … you want to tell me the problem with these people was a failure to recognize the immutable laws of physics and restrict their calories? i read the chapter. fyi, that “study” you keep using to prove your entire argument didn’t go down the way you say it did. Got any links or documentation to this “study” or are you just going by word of mouth? your book is being disingenuous. Jimmy Moore is still unfortunately morbidly obese and just not a healthy human being. Only the abstract and first page are available online. I had a researcher friend dig up and send me the full study, which I’ve read and quoted directly in two posts. So if you know something about how that study “went down” that I don’t, do share. If you want to believe calories in exceeding calories out is the root cause of gaining weight instead of the downstream effect of a biological drive to get fatter, please, be my guest. I’m sure human metabolism is, after all, no more complicated than a piggy bank. I’m also sure that when a plane crashes, the root cause is that altitude lost exceeded altitude gained. And when people become millionaires, the root cause is that money deposited exceeded money withdrawn. You’ve clearly got it all figured out — people get fat because they just eat too much! — so go and spread that insight to the millions of obese people who’ve been waiting for the answer. The commonly held belief that obese individuals can ameliorate their condition by simply deciding to eat less and exercise more is at odds with compelling scientific evidence. … on what basis have you decided he doesn’t actually know what he’s talking about? Is it your educated opinion that he’s simply failed to understand how the laws of physics apply to human biology and therefore hasn’t recognized that losing weight is a simple as putting fewer calories into the system? By the way, I’m issuing you the same warning I’ve issued to others in the past: I encourage debate and discussion because I believe it’s good to challenge our beliefs. But this blog is not a forum for morons to spew their venom on Jimmy Moore. If you want to challenge what I believe, go ahead. If you want to keep using Jimmy as your whipping boy, do it somewhere else or say goodnight, Gracie. Charley Cosmo? Must be related to Bill Nye the Science Lie. I was hoping he’s a distant relative of Cosmo Kramer. You’re really not proving anything by saying Jimmy is obese. Not only is he a case of one, but also you do not know how many calories he consumes. 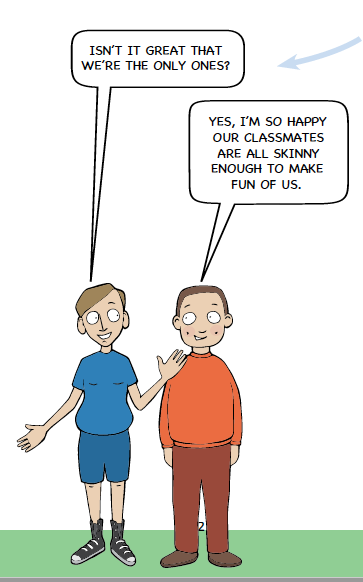 You’re only making assumptions. Chareva is working on a Kindle version, which will be followed by an e-book version. Tom, this might be intended as a book for kids, but it sure makes sense for an adult. it’s all about calories. If you want to have bigger muscles you have to accumulate energy, therefore you need to increase your energy intake and/or decrease your physical activity. This is a physics’ law you can’t violate: eat more and watch television all day long. Any method that increases your muscle mass does so by increasing your appetite or by reducing your physical activity. Congratulations for the book. Every obesity researcher should read your book. Awesome. After working loooong days on the film, I’ll sit in front of the TV tonight with some snacks and grow my biceps. I knew Vicente was on my side. I was playing along with his humorous idea. Maybe that got lost in translation. I was serious in the part where I said every obesity researcher should read your book. No joke there. I hope real obesity researchers already get the concept. We quoted one in the book. I suspect the problem is more with doctors and public health officials who still believe it’s a simple matter of eating less. Great first chapter. A bit beyond my almost-five-year-old, but she’ll get there. She has already requested chicken cheese roll-ups for dinner three nights in a row, along with (still frozen) peas, and taken same to school for a snack. Also, I love Chareva’s illustrations–especially the most pertinent of details on the plumber drawing! It’s going to be a bit above the reading and comprehension level for most five-year-olds. We had adolescents in mind. Chareva is a terrific illustrator in my humble opinion. Pretty awesome wife, too. Will the film version be more accessible to those who haven’t yet reached their teens? I have a young friend whose overweight ten-year-old daughter is being threatened with statins because of a total cholesterol of 400. (The child’s doctor ordered that she be given no more than two eggs a week, but of course prescribed hearthealthywholegrains. But at least he had them cut out sugar and fast foods.) I tried explaining a few things but didn’t get anywhere, and the mother prefers TV to reading and probably would not read the book, so maybe the film would benefit both. I think the film version will be easier for younger kids to grasp because of the animations. She commented that the illustrations are great and funny. Tell your daughter thank-you from both of us.